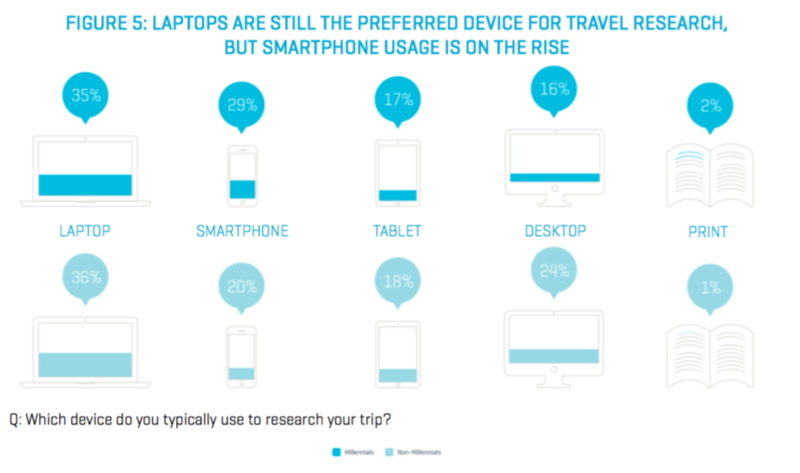 Consumers are spending more time planning and researching their vacations, and they’re using multiple devices to do so. Online research typically starts 45 days before booking, with most individuals devoting 2-3 hours to research. Our study showed that 16% claim to spend 6 or more hours planning. While travelers still rely primarily on their laptops, millennials are increasingly using their smartphones to conduct research. The number of websites visited by travelers while planning a trip is on the rise. 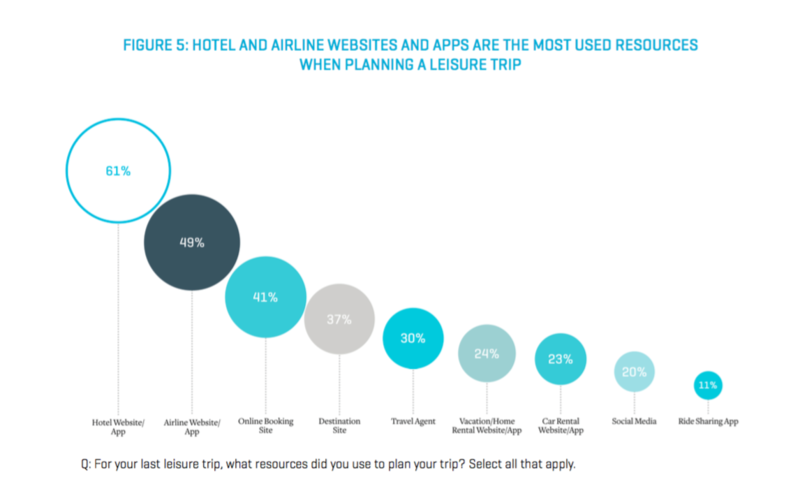 Hotel websites and apps are the most frequently used, followed by airline websites and apps. Our survey showed that 38% of respondents claim to spend at least one-hour reading travel reviews, while another 30% spends two hours. Still, most of travelers’ time planning is spent looking for the best deal - especially when it comes to flights and hotels. Consumers will check multiple sites on multiple days to ensure they are getting the best price, yet even then fear they are overspending. 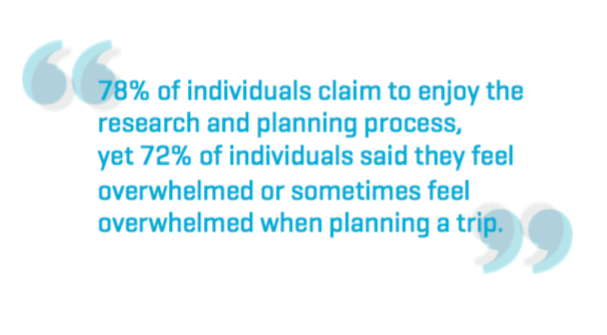 However, with so much information available, travelers feel confident in planning their own itinerary, with 78% claiming to enjoy the research and planning process. Despite the depth of research, many consumers still suffer from FOMO - fear of missing out - if they skip a particular activity, restaurant, or attraction at their destination. In fact, even though they profess to enjoy the process, 72% of individuals said they feel overwhelmed or sometimes feel overwhelmed when planning a trip. Once travelers arrive at their destination, many continue their research process. However, at the end of the day, most individuals (79%) said they felt they had spent the right amount of time planning their trip once they’ve arrived. While consumers overall seem relatively happy with the planning process, there is ample opportunity for travel brands to better serve them. We found that 39% of travelers felt personalized recommendations would make trip-planning more enjoyable, while another 31% stated they would want recommendations that come from a real person (i.e., not automated). The most frequently requested service for which travelers turn to booking engines is the ability to book multiple travel elements (flight, lodging, excursions), followed by the ability to see all of their itinerary details in one place. Very few existing booking experiences perform either of these tasks well. Existing online travel agents (OTAs) face threats by new services that can better aggregate and bundle multiple trip components – services that behave like a simplifier, not just an aggregator of data. Meanwhile, brands are also atomized in this planning process. They live as micro-moments across myriad devices and touchpoints. Brands that uphold strong and consistent behavioral guidelines will have an easier time building meaning across so many small interactions. Hotels and airlines should invest in their websites and apps as they are the most used resources for travelers during the planning phase. Start acting as a simplifier to meet the needs of travelers who are overwhelmed when planning a trip. To learn more, download our newest Whitepaper, ‘Targeting Moments of Need in the new Travel Landscape’ – here.